A perfect mix of activity, relaxation and luxurious pampering. Join See Change PT and Footstep Adventure for the trip of a life time. Feel energised, invigorated and refreshed after this Balinese holiday. Practice yoga and learn to surf in a beautiful setting with world class instructors, with optional activities for those after an extra challenge. This is guaranteed to be an adventure you will talk about for years to come. See Change PT believes in bringing your fitness to life. We see the real value of being fit and healthy as being able to use this fitness in fun and interesting ways. This active retreat has been designed with this philosophy in mind. 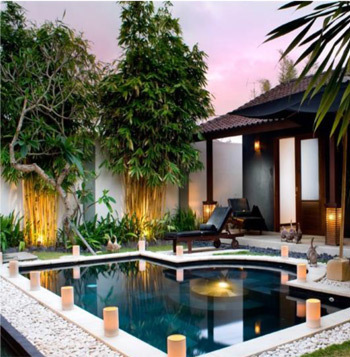 Bali is a destination perfect for mixing relaxation and adventure, so we have planned a flexible itinerary to allow you to challenge yourself with new activities with the freedom to laze by the pool, shop, sightsee or do whatever you please. You will be accompanied by our See Change personal trainer, Stella Skinner. Stella loves being outdoors with a special interest in adventurous holidays. Stella’s most recent trip was hiking in Nepal with Footstep Adventure. Stella and Footstep have designed this trip to give you the opportunity to travel with like-minded people who are also looking for a holiday with a difference – active with the extra elements of luxury and relaxation. comfortable with the people you will travel with and give you the opportunity to ask any questions. You will be invited to attend a casual night out to meet the others on the retreat. Your See Change trainer Stella will run 4 group training sessions designed specifically for the Bali tour group. She will concentrate on building your endurance and strength for yoga, surfing and lazing by the pool! On arrival on Day 1, you are free to do your own exploring with our official meet and greet session prior to dinner. Our group will start each day with a private yoga class tailored to suit all levels from complete beginners to the advanced yogis. A peaceful start to the morning followed by a healthy breakfast. With its stunning beaches and abundance of waves, Bali is one of the best places in the world to learn to surf or improve your skills. 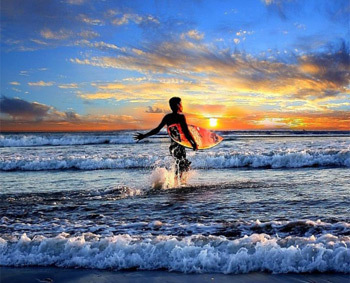 With a surf lesson on 5 of our days, you’ll be carving it up by the end of this trip! On days where we are surfing, we will return to our luxurious accommodation by lunchtime where you are free to do as you please – rest, laze by the pool, go for a walk, shop – there is plenty to do locally. Each day there will be an optional run on the beach or bootcamp at around 5pm. Any of the activities we do are optional. We encourage you to “give things a go” however there is no pressure to do anything at all. On Day 5 we head to Ubud for a day of sight seeing including visiting traditional markets, the monkey forest and optional white water rafting. By Day 6 your “surf muscles” will ready for some attention, so a massage each is in order after lunch. 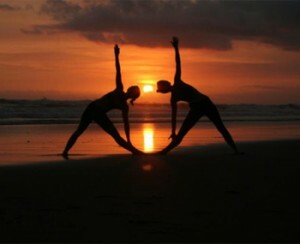 By Day 7, you should be feeling very relaxed in your yoga session, and showing off with some new surf moves. In the afternoon we will go snorkeling then out for our final dinner in Jimbaren Bay which is reknowned for its seafood restaurants on the beach. Day 8 will be our final morning together where we reminisce and say goodbye over breakfast. 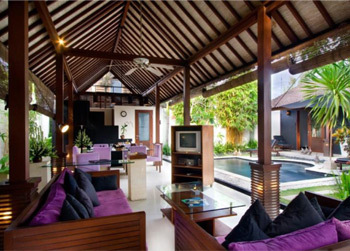 7 nights accommodation in a beautiful 5 star Balinese Villa with private pool. Daily Surf instruction in small groups of 3 or less with one of the top surf schools in Bali. Private Yoga lessons every day. All of your local transport and transfers while in Bali. A fully cooked healthy and delicious breakfast daily. The opportunity to experience a rewarding and healthy holiday that will leave you looking and feeling fantastic. * Does not include flights. Flights can be organized if required. Ask Stella for more details if travelling with children. Why Travel with Footstep Adventure? Footstep Adventure holidays came about as we were looking for an adventurous way to spend our annual holiday and were disappointed with what we found. So we created Natural Order Adventure with the intention of providing a great activity filled holiday where people could spend their time with other like-minded travelers. From the moment you sign up for your trip to the moment you arrive back home with those new memories and friends we ensure that you will have an incredible time. We only run trips that we are passionate about and that we would like to be on ourselves. We love it and we are passionate about making sure that you will too. Sign up for our See Change PT Newsletter! Kickstart your fitness with one of our famous 4 week Bootcamp and Basecamp courses. 9 out of 10 people like Bootcamp so much that they sign up again. New courses start every 5 weeks so check out our dates. Work, family, health. It's a constant juggle. Our class packs give you the flexibility to come and go as your schedule allows. Want to work at your own pace? Whether you are a long time fitness junkie, haven't exercised in 50 years or are training for a specific event. Our personal training sessions will keep you working to your own personal limits. Read more. © 2019 See Change PT. All Rights Reserved.